Next up in Book Battle 2015 is a book that has been turned into a movie. This was such a broad category I wasn’t really sure what to choose. There are so many books that have been turned into movies and television shows. 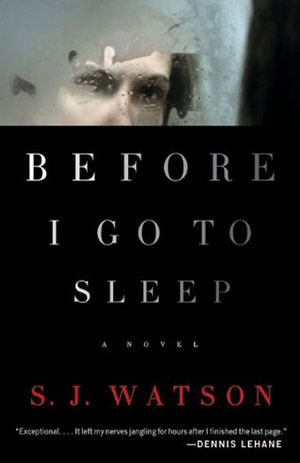 I finally narrowed it down to two different novels and ended up choosing Before I Go To Sleep by S.J. Watson. The book jacket said that this is a novel about a woman with a rare form of amnesia. She wakes up every morning not knowing who or where she is. One morning she could be a child and the next she could be an adult in her 20s, when her accident happened. Then she starts to regain memories and doesn’t know who to trust any longer, including her long suffering husband. To me, this novel encapsulates one of the worst kinds of fears, the fear of losing yourself. Not knowing who you are anymore and not being able to trust your own mind. The movie adaptation stars Colin Firth, a favorite of mine, and Nicole Kidman. In great news, it’s on Netflix. I can’t wait to finish the novel, watch the movie, and then compare the two. 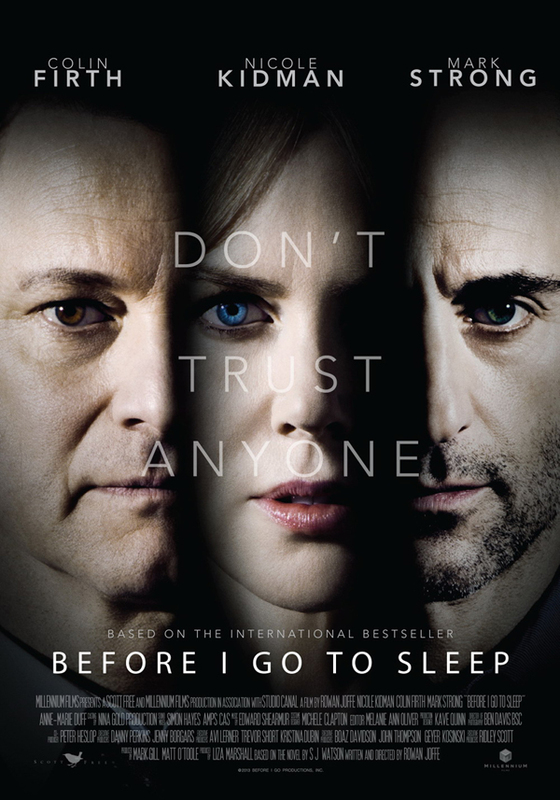 Stay tuned for the review of Before I Go To Sleep. Happy reading! I had such a visceral reaction to the first few pages of this book that I had to step away for a couple days before I could pick it up again. Nesbo is decidedly unrelenting in his depiction of violence and depravity but it does work in the contexts of this book. The scene in question involves a kind of torture device used in Africa called the Leopold’s Apple. Definitely not for the faint of heart. However, looking deeper into the story it’s much less about the violence and much more about the deconstruction and reconstruction of a man. Part police procedural, psychological thriller, and man’s search for answers within himself, The Leopard is one roller coaster ride of a book. The novel, after I was able to pick it up again, started rather slowly but sure picked up towards the end to the point that I couldn’t put it down. Taking place in Oslo, rural Norway, and even the Congo the novel has many twists and turns I never expected. Nesbo guides you through his red herrings and makes you believe everyone. Just when you think you know who the killer is guess again. Even prized detective Harry Hole is surprised with this one. My favorite quote from the book occurs when Harry first goes to the Congo. For me this quote solidified much of the book and the way many of the characters interact with each other. Harry and his Congolese taxi driver are talking about a snow leopard and the driver states: “That one is almost impossible to hunt. It is rare, has large territory, only hunts at night. Hides and blends into environs during the day. I think it is very lonely animal, Harry.” This quote applies both to Harry and the people he hunts, two sides of the same coin. As Harry’s father says, love and hate are the same just the flip side of the coin. Nesbo does an amazing job of showing this disparity, especially in the characters’ relationships with each other. How easy it is to flip the coin on the person next to you and how perhaps the hate you thought was destroying you could be your saving grace. Now, this is the 8th book in the series and I definitely felt at a slight disadvantage not knowing what had happened in the previous books, since the events were heavily mentioned as influencing personality and behavior. It also makes me want to know more about Norway and the culture there since there are many different dialects brought up and placed on certain people in judgement of reverence. Overall, I really enjoyed the ride this book took me on. While terrifying, it made me think and read between the lines, exactly what a book is supposed to do. Stay tuned for the next book in the battle!! For the next battle, a book recommended by a friend. For this challenge I’ve chosen Jo Nesbo’s novel The Leopard. One of my good friends from college recommended this book to me because she knows that I like mysteries and scary books. And this one looks like a doozy. I’ve never read a book by this author before but am excited to check it out. I’ve read a few Scandinavian mysteries before, most notably The Girl with the Dragon Tattoo, and have loved the grit and suspense in them. The pacing is so different from a lot of American mysteries and thrillers, slower and centered around psychological suspense. I’m a big fan of reading novels that take place outside of my home state and country. It’s so interesting to read about how other cultures and people relate to each other and how their environment affects mood and pace. I can’t wait to dive right into the Norwegian winter and see what happens. Stay tuned for the review of The Leopard! What book are you reading next? The Secret Place is the fifth book in Tana French’s murder squad series and let me tell you, it doesn’t disappoint. Following young Stephen Moran, who last made an appearance in Faithful Place and is now working cold cases, the novel starts off with a seemingly innocent picture on an index card found by Holly Mackey on a board her school calls The Secret Place. Wanting to move on from cold cases and into the murder squad, Stephen takes the card of Chris Harper, murdered on the grounds between St. Kilda’s and Colm’s, both boarding schools, to Antoinette Conway. Conway has made herself into an almost larger than life ballbuster to survive and thrive in the male dominated murder squad. Pairing up, both for their own reasons, the two set out card in hand to delve into the lives of teenage boarding school girls, and it’s terrifying. This is mean girls gone bad. Being removed from the outside world, these girls are secluded and totally reliant on each other creating an it’s them against the world mentality. Masterfully, Tana French reveals the layers and layers of vulnerability, cruelty self-preservation, loyalty, and burgeoning sexuality that in this school is akin to a social currency. There are four girls at the heart of the mystery of who killed Chris Harper and watching them ebb and sway together, like swallows in the sky trying to stay together but ultimately breaking apart, is breathtaking. This book is so much more than a mystery/thriller. In it’s own way it’s a coming of age novel. It’s about becoming aware that everything in life is fleeting. Nothing, no matter how hard you try to hold onto it in your clenched fists, will remain static forever. The most poignant moment in the novel for me is when Holly’s mother comes home after meeting an old friend from her St.Kilda days and describes how they haven’t been in contact for years no matter how close they were and is not sure after this meeting if they should be in contact. Their lives have taken such different paths and the only thing that connects them is their past. Holly sees, in one moment of true clarity, how everything will change. The four friends will separate because they are all individuals and not the unit they have been for so long. And perhaps it’s this moment that is the real catalyst of the book, creating the desire to throw the card of Chris Harper into the mix. Stay tuned for the next book in Book Battle 2015! I’ve been under Tana French’s spell since her first novel In The Woods. She has such a lyrical writing style that manages to evoke such startling images in my imagination. In particular, I love how French recycles her characters in her novels so you can see different facets of them. While not necessarily your typical mystery fare, French is one of my favorite mystery/suspense writers. I enjoy her intense focus on her characters in their growth and dissolution. She really manages to let her audience dip their toes into different groups of Irish society and experience them. The novel prior to this one, Broken Harbor, left me with chills. Showing the slow deconstruction of a person and how little it takes to make humanity snap was terrifying and eye-opening. French is a no holds barred writer, something I myself aspire to be. She creates full bodied characters that are capable of great things and of terrible things. They’re human, trying to work their way around in the world without instructions. So follow me on this adventure into the darker side of human nature. It’s sure to be interesting if a wee bit terrifying.